UCU Left | The Shock of the new! The Shock of the new! All strikes are important but there are some strikes which reflect a wider political shift taking place within society as a whole. The strike by 40,000 HE workers across 64 universities is one of those. Anyone who has visited the university picket lines or strike meetings can’t help but be inspired. Thousands of UCU members have been involved in picketing. Strike committees have been set up in a number of Universities. I attended one to give solidarity greetings from FE UCU members at UCL where 200 people packed into a room to report on and discuss what is happening in their dispute. The meeting was filled with energy and determination. The strike has won wide support from the public and students. As I left the UCL meeting I saw a group of Muslim students refuse to cross the picket line and instead hold their Friday prayers on the grass verge outside SOAS. 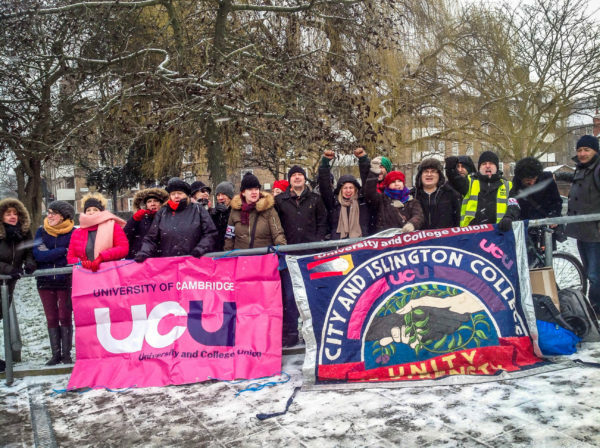 The high point of the strike so far was on the last day of the first phase of the strike when 5,000 UCU members and students demonstrated in blizzard conditions and marched through central London to Parliament Square. Thousands also marched in Sheffield, Liverpool and Bristol. The Daily Mail in its ridiculous article aiming to undermine the strike by purportedly exposing some of us as ‘Commies’, nevertheless ironically had to concede, ‘Whatever agendas are at play, an objective analysis of the dispute might find many indications that the lecturers’ cause is just’! The article starts with red baiting and finishes with VCs are greedy bastards and UCU has a point! The solid two-day strike by 16 FE colleges over pay and conditions that started on the last day of the first phase of the HE strike also shared the same hardening of attitudes and a resolve to win. All UCU branches report more members joined picket lines than ever before. It is not the first time recently that the establishment have completely mis-judged the situation. Just like the Corbyn victory and the vote to leave the EU, employers, politicians and journalists are so disconnected from the world the rest of us live in they get caught out. The support from the front bench of the Labour Party has been a very important change compared to disputes in the past. It makes a difference and gives legitimacy to our dispute when Jeremy Corbyn gives his total support. It has given a boost to all those on strike to see members of the shadow cabinet speaking unreservedly in support of the strike as John McDonnel, Angela Rayner and Gordon Marsden did at the London Region strike rally at Westminster Central Hall last week (link in here to video of McDonnell speaking). But whilst the strike is a brilliant example of how sections of the trade union movement, that have historically not been seen as the most militant, can make a huge leap to give inspiration and hope to the whole of the Labour and Trade Union movement, it didn’t come out of nowhere. Of course, losing £10,000 a year from your pension and a 21% cut in wages does tend to focus minds but this is not the only explanation for why the strikes have been so well supported both within the union and from outside. The visceral anger and determination to win shown by those on strike reflect the wider concerns and experiences of those who work in Higher and Further Education. The marketisation of the sector leading to the introduction £9,000 student fees and the narrowing of educational values to ‘employability’ has enraged those who work in the sectors. The negative impacts on those they teach are seen daily. During the HE strike Teach-outs have taken place across many campuses involving staff and students. Topics such as the demand for decolonisation of the curriculum to the impact of neo-liberalism on education have been hotly debated. Those who work and are taught in the sector see this strike, not only to stop employers robbing their pensions, but also to roll back decades of privatisation and competition within Higher Education. Lecturers across FE and HE were one of the driving forces behind the biggest mass strikes in British history in response to cuts to public sector pension schemes in 2011. With the marketisation of Higher Education has come a continuous deterioration of working conditions over the last thirty years and which has sped up since the financial crash of 2008. It is not at all surprising that many of the 3,200 people who have joined UCU in the first week of the dispute are women, workers from BAME backgrounds and younger workers. 50% of staff who work in the sector are on casual contracts with women and BAME staff disproportionally making up the bulk of these. Women get paid less than men. BAME workers are also amongst the lowest paid. The issue of racism and sexism experienced by so many within the sector is one of the main driving forces behind this new militancy. We on the Left, over the past decade since UCU’s formation, have been alert to these changes and have successfully built networks that have helped to build a strong union ready to challenge the effects of the ever-increasing spread of neo- liberalism within our workplaces and provide a coherent alternative to it. The articles on this website charts the path we have taken over the years to get to where we are now. The strikes have been transformative. UCU has changed. But we are only at the beginning of this change. This is why UCU London Region has called a UK-wide activist day-school on Saturday 21st April. There are thousands of new activists who need to meet, network and excahnge ideas about how to build the union. There are also UCU branches in universities and FE colleges that have not yet experienced the new mood of militancy that has swept across the universities and that has started to take hold in some FE colleges. The aim of the school will be to generalise the best experiences across HE and FE. We don’t know where we will be with the HE dispute in a few weeks’ time but win or messy compromise, such an event will be important. In FE there are 56 colleges that have put in claims over a range of issues, many will be in a situation where they too will want to ballot for action. The school will be a practically based one, led by those who have been at the forefront of the action over the last few weeks. Of course, the outcome of HE dispute will determine how far this transformation will continue. This is why it is positive that Sally Hunt has not called off the strikes whilst talks are ongoing. We can achieve a clear-cut victory against the employers. Many activists are calling for UCU to harden its negotiating position to one of “status quo”. If the scheme is not in trouble why should UCU offer that members pay more? There is an expectation and a belief amongst strikers that they can and will win. We call upon the whole of the labour and trade union movement to do what it can to help deliver a victory that will benefit us all.